They say everybody wants to go to Heaven, but nobody wants to die to get there. This tenet holds true on a smaller, earthly scale as well. We all want to get in shape, but not everybody wants to go to the gym to get there. Membership fees, lines for the machines, that one guy who takes all the free weights and never puts them back – pass. Fortunately there are a lot of great ways to get an effective workout without leaving the house. Since we created the first freestanding punching bag, Century has been a firm friend to the home gym crowd. Whether your exercise space occupies a full room or is a mat that you roll out when you need it, we have the equipment you need to boost your work out. One of the latest fitness products from Century is designed to allow you to get a full-body workout, without going to the gym or even leaving your room! 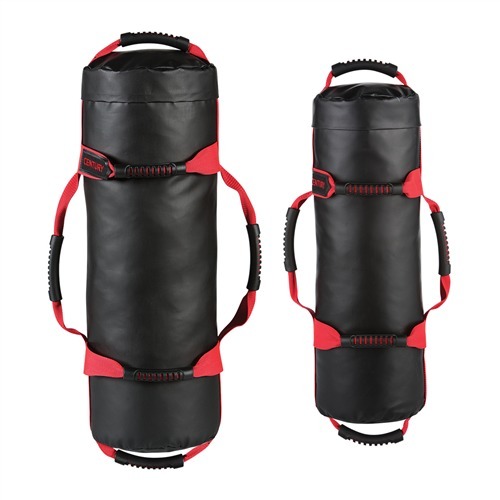 Our Weighted Fitness Bags are available in 15 and 30 lb weights, for various degrees of difficulty. Six handles located along the sides and top/bottom of the bag allow you to switch your grip as required for different exercises. Standing Rows: Hold the top handle of the bag with both hands. Lift the bag by bringing your elbows up until they are level with your shoulders or head. Slowly lower the bag to its starting position and repeat. Overhead Press: This exercise can be done standing up, or lying down on a bench or the ground. Grasp the bag by either the top/bottom handles or two of the side handles, as you prefer. If standing, start with the bag held at chest level. Lift it up, raise it above your head, then slowly lower it to the starting position. If lying down, start with the bag positioned above your chest. Lift it straight up, then lower it until your elbows are at a 45 degree angle. Curls: Hold the bag in front of you by two of the side handles, gripping to your palms are facing up. Keeping your elbows at your sides, lift the bag and bring it in towards your chest. Pause at the top of the lift, then slowly return the bag to its starting position. Split-Level Pushups: Start in the push-up position, with one hand on top of the bag. Do a push up, then bring your other hand in so that it is now on the bag. Take the hand that was on the bag off and place it on the floor and do another push-up. Repeat, going back and forth between hands. Twists: Sitting on the ground with your feet in front of you, bend your knees at a 90 degree angle. For a greater challenge, lift your feet up off the mat. Hold the bag lengthwise across your chest (you can hold the side handles or top/bottom handles, depending on your preference). Keeping your back straight and chest lifted, twist your upper body around to one side while keeping legs steady. Twist back to the middle, then the other side. Repeat twisting back and forth. Pull-Through Planks: Assume a plank position with the bag on the lying lengthwise to your left. With your right arm, reach under your body, grab the end handle of the bag, and pull it through to the other side. Place your right hand back on the ground. Then reach under with your left arm, grab the bag, and pull it back again. Repeat. Mountain Climbers: Set the bag on the ground and place both hands on it. Your legs should be straight behind you, with your weight on your toes (similar to planking). Bring one knee up to your chest, then shoot that leg back out as you bring the other knee in. Continue to quickly move alternating knees. Squats: Position the bag where it is resting across your shoulder blades, and take a side handle in each hand. 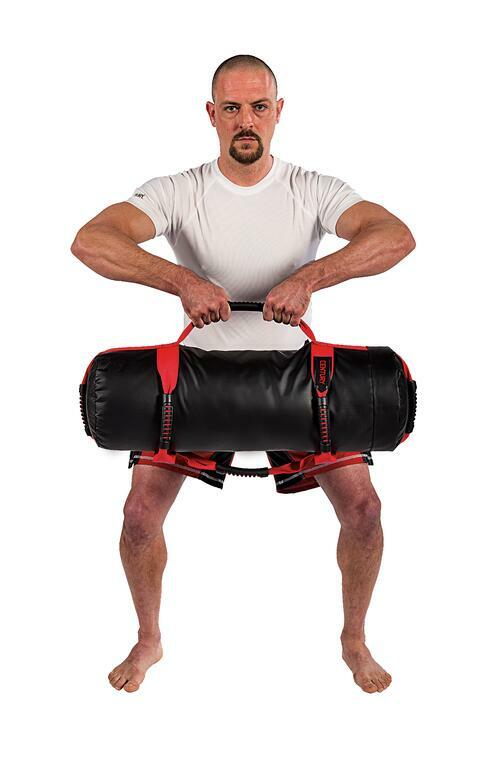 The bag will provide extra weight as you squat, for a harder exercise. 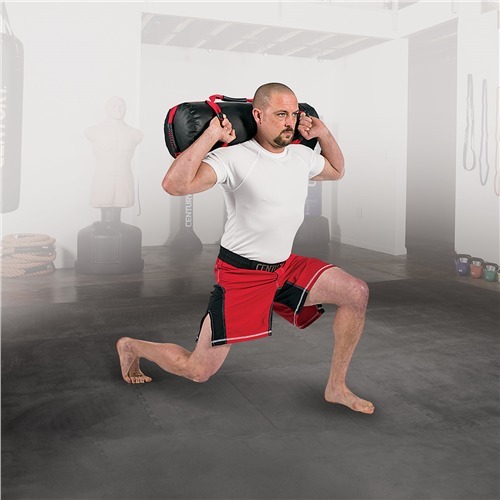 Lunges: Put the bag over one of your shoulders (the center of the bag should hit the center of your shoulder top). Stabilize the bag with one hand. Lunge forward with one foot, step back, and lunge forward with the other. Make sure to repeat the same number of reps holding the bag on the other shoulder. Tip: For an exercise that will challenge your arms, core, and legs, hold the bag above your head while doing lunges or squats. Make sure to keep your abs tight and engaged while doing so, and remember to breathe during each exercise.